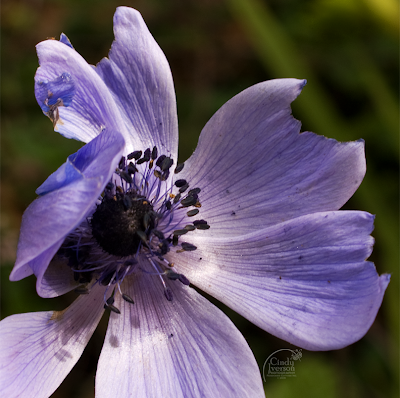 Even though it was another gorgeous sunny day today, I was feeling a bit like this anemone blossom today--worn, tattered, and blue. Life has been a roller coaster as of late, going from the low of last Friday with Hubby's father being in the ER, 4 hours away, unconscious and the doctor discussing "end of life options" to the high of only 4 days later (Tuesday) Hubby's father being well enough to be transferred from the hospital to a skilled nursing rehabilitation facility for a long-ish stay to hopefully get back his health after a long year of post-chemo struggles with not eating or being physically active. It's all been very exhausting, to say the least. I guess I was running on fumes until today when the fumes finally evaporated, and I was hit with feeling... well... blah. Today, I managed to get out to the garden centers in our area to buy some large pots I needed and found two lovely lavender bushes as well as the bay laurel tree I've been wanting since I found out that a sprig in the pantry keeps weevils out of the flour and grains. Once home, I got the lavender bushes and bay laurel planted in their new homes. I also transplanted a New Zealand flax into the ground that's been floundering in a pot. Usually when I've achieved that much in the garden, I'm all chipper and bouncy about it. But I'm just not. Yeah, I'm definitely having a blue anemone day. But, hey... you gotta have one once in a while, right? I totally understand your feeling. Hope your father in law is doing much better. Life is full of ups and downs but I wish you lots and lots of ups in the coming weeks and months. Oh, Sweetie. You should expect to feel a bit tattered after all the emotional upheaval you've been experiencing. I'm glad to hear that your father-in-law is rallying. Cindy, you are right, we do get these days. They will pass, it is just a grey day. I am pleased you got your bay, there is something about having a bay in the garden. Mine is against a wall that has just been painted and I have had to cut it back to two trunks, I am thinking of topiarying it - cloud type. But will I remember to prune it often enough! Even though it was a blue day, your giving it a parallel to a flower lends a beauty to the day, to caring about your father-in-law, to planting and gardening in which you found peace. Oh dear! Buying plants usually does it for me, too. Sorry you are feeling so blue! You sure have been through a lot lately! I really hope that things work out well for your FIL. Sad news to hear. Make time to look after yourself. It sounds like you have a lot going on right now. Sit down and have a cup of herbal tea, and maybe indulge in a cookie. And know that we are thinking of you. Some days are like that. And when you go to the garden on those days, it's to relax and rejuvenate. I'm glad your fil is better now; these events affect everyone around him and you. Not surprising you need your quiet garden time. We all those kind of days especially with added stress. We can't have the best every day but tomorrow is a brand new day. Hope you feel better soon. Hia Cyndy after such an emotional drain like that no wonder you are feeling a bit wind battered. I hope you can rest up and recoop your zing. Honey, I am sorry that all of this seems to have ganged up on you at once. And yes, it is ok to have a blue anemone day. I love the way this blossom looks like someone has taken big chomps out of each petal. I think we all know what it feels like to have one of those days, but it doesn't make it any better for you, our knowing. The irony of the bit of tatter on the edges of the anemone isn't lost on me. The anemone is beautiful, and cause for joy, yet there's a raggedness that keeps it from being full-blown. Kind of like your day, huh? I've been behind on reading blogs lately. I'm sorry about your father in law and pray that he will recover quickly.